The European Space Agency has just released this stunning self-portrait of the Rosetta spacecraft, taken less than ten miles from the surface of Comet 67P/C-G, which is emitting streams of gas and dust into the depth of space. 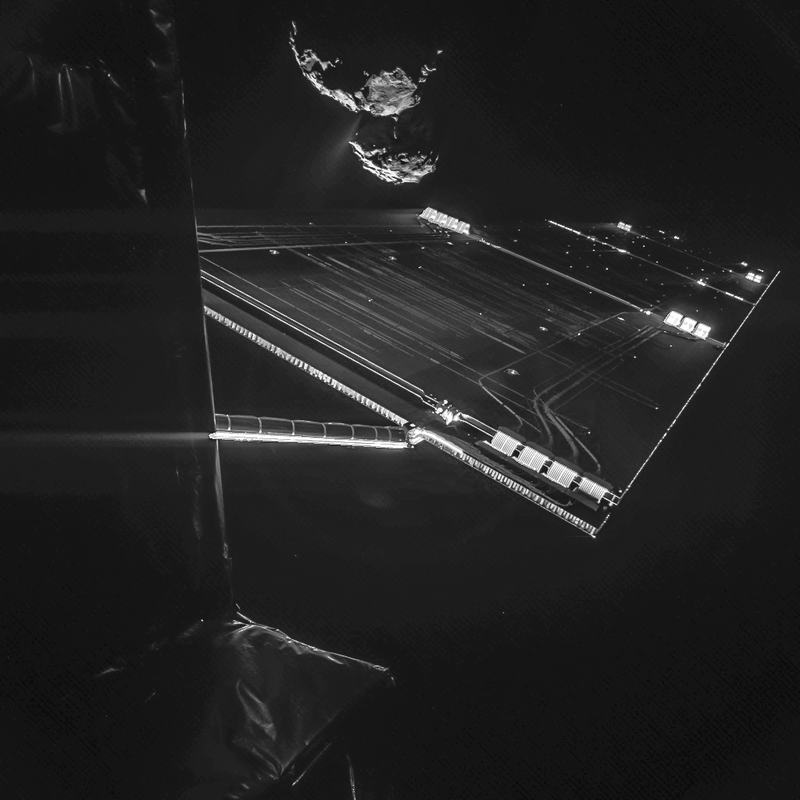 This latest image will be the last one taken by the Philae lander before it separates from Rosetta on November 12. Not only is there a clear view of one of Rosetta's 45-foot-long solar arrays, but the primary landing site, currently known as Site J, can also be seen on the smaller lobe of the comet. The "jet activity" at the neck of the comet is the product of ice sublimating and gases escaping from the comet's nucleus through cracks and pores on the surface. As comets travel closer to the sun, the dust-laden plumes of vaporizing ice are pushed back by the pressure of sunlight, forming the iconic dust tails. Comets usually develop a second tail — the ion tail — when solar radiation excites the gas particles, causing them to glow.